National Ag Week is celebrated this week. National Ag Day is Thursday March 20. More than three million people farm or ranch in the United States. Individuals, family partnerships or family corporations operate almost 99 percent of U.S. farms. Over 22 million people are employed in farm or farm-related jobs, including production agriculture, farm inputs, processing and marketing and wholesale and retail sales. According to the 2002 Census of Agriculture, 50 percent of the farmers are 55 years of age or older, up only three percent from 1997. Average age of the principal operator is 55.3. Forty-one percent of U.S. total land area is farmland (938.28 million acres). In 1900, the average farm size was 147 acres, compared to 441 acres today. The top five agricultural commodities are cattle and calves, dairy products, broilers, corn and soybeans. U.S. farmers produce 46% of the world’s soybeans, 41% of the world’s corn, 20.5% of the world’s cotton and 13% of the world’s wheat. they produce. In the 1960s one farmer supplied food for 25.8 persons in the U.S.
and abroad. Today, one farmer supplies food for 144 people in the U.S. and abroad. The Changing Face of Agriculture Farmers and ranchers are producing meat lower in fat and cholesterol. This has resulted in retail cuts that are 15 percent leaner, giving consumers better value for their dollar. For example, a pork tenderloin now has only one more gram of fat than a skinless chicken breast, one of the true fat "lightweights." Also, much leaner beef cuts are being produced than 20 years ago, resulting in 27 percent less fat reaching the retail case than in 1985. Research and advancements in biotechnology are now in the marketplace with tastier fruits and vegetables that stay fresh longer and are not damaged by insects. A new technique called "precision farming" boosts crop yields and reduces waste by using satellite maps and computers to match seed, fertilizer and crop protection applications to local soil conditions. 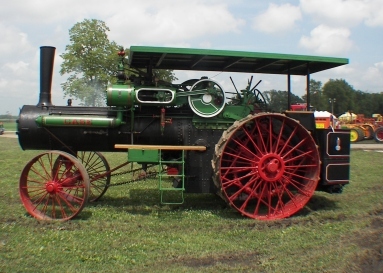 Farm equipment has evolved dramatically from the team of horses used in the early 1900s. Today’s four-wheel drive tractors have the power of 40- 300 horses. This makes for a large capital investment, as farmers pay anywhere from $97,000 for an average 160 horsepower tractor to $170,000 for a four-wheel drive model. As the amount of mechanization and horsepower in farm machinery has increased, the time needed to complete tasks has decreased. Combines, huge machines used to harvest grains such as corn, soybeans and wheat, have dramatically changed agriculture. In the 1930s, before the machines were available, a farmer could harvest an average of 100 bushels of corn by hand in a nine-hour day. Today’s combines can harvest 900 bushels of corn per hour-or 100 bushels of corn in under seven minutes! The efficiency of U.S. farmers benefits the United States consumer in the pocketbook. Americans spend less on food than any other developed nation in the world. On average in 2004, Americans spent only 2% of their disposable income on meat and poultry, compared to 4.1 percent in 1970.